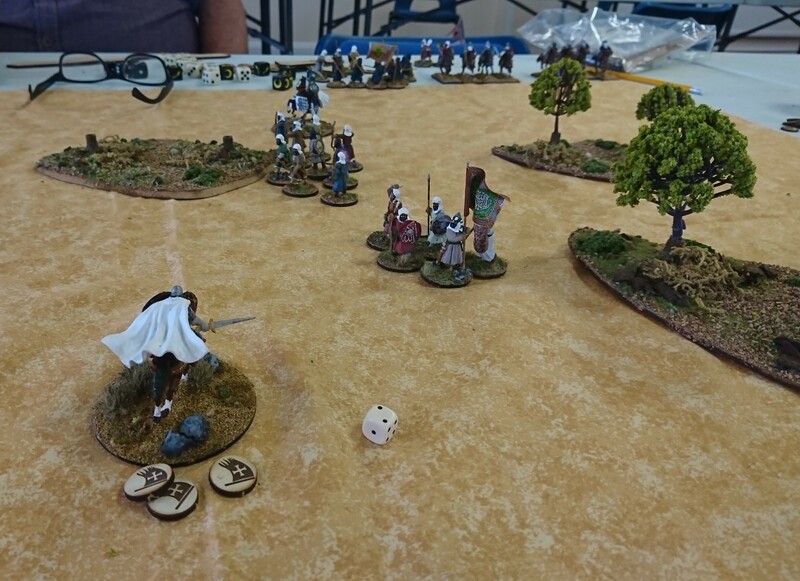 Last Sunday (9th September) saw 16 contenders for the title of ‘East Midlands Iron Man’ meet up in the heart of Leicestershire (Market Harborough to be precise) for a day of playing the new edition of Saga. The idea behind the tournament is to play with 4 random warbands against matched opponents, with the winner being determined simply by the number of kill points earned during each battle. Ideally, each warband should be somewhat unfamiliar, so part of the skill of the day is to be able to quickly assimilate the skills on the faction battle board in order to play your faction to its strengths. Obviously, any player who ends up in control of a faction with which they are familiar can find themselves at a distinct advantage. My aim for the day was to (hopefully) get an understanding of the Saga 2.0 rules, and to have a good time – in that respect, the day can be deemed a resounding success! My opponents were Richard in Game #1, Nelly in Game #2, Graham in Game #3 and Nathan in Game #4. I played Late Romans, Pagan Peoples, Spanish and Mongols respectively. I think it is sufficient to say that my warband leadership was somewhat lacking, and the dice gods were their usual selves (i.e. they were dead set against me) and as a result I ended the day with the wooden spoon – not that that was an issue, as gaining a high placing wasn’t the aim of the day. I did have a great time against four gracious and patient opponents. Thanks to them, and also to Richard Keenan for not only organising the day, but for putting up with my steady stream of rules questions! So, having played a few games with the new rules, what do I think? The new edition is meant to make the game more streamlined – certainly the changes around the Warlord make the game less complex, as you no longer have to deal with the issue of multiple units in combat (which was perhaps the biggest headache of the original rules). Levy generating Saga dice is meant to make these units more desirable in your warband, especially when coupled with the new javelin rules. The downside is that this Saga dice is lost if the unit is reduced below 7 models. Similarly, a Warrior unit now loses its Saga dice if it is reduced below 4 models, which means that any tactic of using small units of warriors as harrying troops (with armies that include mounted warriors with bows or javelins for example) is petty much useless, as you risk losing your Saga dice with the loss of a single model – having larger units of warriors is now the name of the game. The argument is that it now probably more accurately reflects the morale aspect of losses, which is true – it just takes getting used to. It is my understanding that the changes to Javelins is proving to be both controversial and problematic – an FAQ ‘fix’ has recently been introduced, but in my experience on the day, this has just led to more confusion whilst actually breaking some faction abilities (Spanish, for example). As a casual player of the game, but one who owns all the first edition rules and supplements, nothing that happened during my games on the day led me to the conclusion that I must puchase this new edition. I did really enjoy playing with the medieval factions, so making warbands for ‘The Crescent and The Cross’ has risen up my priority list – something for next year I think. In the mean time, the wooden spoon prize of a pagan priest figure has given me something with which to beseech the dice gods in future games. Thanks for the write-up, Neil. Like yourself, I own all of the 1st edition stuff but haven’t had much of a chance to play (and get my money’s worth from it). Since I’m not fussed about tournaments, I reckon I’ll just keep to what I already have. Warlords are still protected by close by troops, but now only Hearthguard can take the Warlord’s hits.